In SYMOBIO, a learning and smart monitoring system for the bioeconomy will be developed. For this purpose, key criteria and indicators for bioeconomy assessment will be derived. An integrated modelling approach will be developed to analyze environmental footprints and the socio-economic performance of the bioeconomy. Additionally, the improved use of certification and life cycle assessment (LCA) will be explored. 1) Definition of an appropriate framework for a systemic monitoring: The expectations about the bioeconomy from politics, economy, non-governmental organizations and science are systemized. Important criteria and indicators for its assessment are identified. 2) Development of a modelling and assessment system: A multi-scale system for the analysis of the bioeconomy with regard to sustainability is developed. Material-flow models, Input-Output-databases, econometric models and land- and water use models are linked. Footprints of land, forest, water use and greenhouse gas emissions are calculated and the socio-economic balance of the bioeconomy is estimated. 3) Analysis of the key drivers for the bioeconomy transformation: Trend determining factors are analyzed: agricultural production systems, food consumption patterns, food waste, energetic and material use of biomass, recycling economy and cascading use as well as new technologies. 4) Modelling of recent trends and their impact on environment and socio-economy: Analysis of past trends and status quo. Counterfactual modelling is applied to estimate the effect of the bioeconomy. Prospective development trends and their impact are modelled as well. 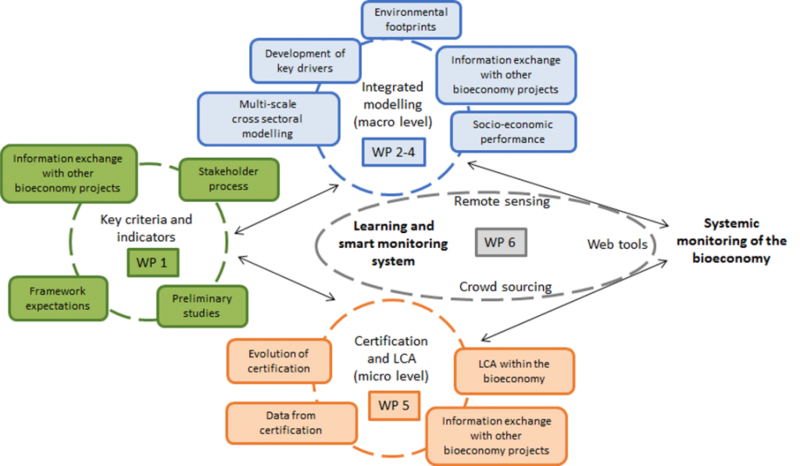 5) Indicators and data generated by certification and life cycle assessment (LCA): The use of data and indicators generated by certification and product LCA for the monitoring of the bioeconomy are explored. 6) Development of a monitoring system: A pilot monitoring report for the German bioeconomy is provided. An interactive website is created where data and characteristics of the bioeconomy can be explored. Remote sensing techniques are tested nationally and internationally to show the influence of land use change on biodiversity. The results are used for monitoring and certification purposes. The project coordination team organizes the information exchange within the project and with two other bioeconomy monitoring projects led by the Thünen Institute (funded by the Federal Ministry of Food and Agriculture) and the ifo Institute (funded by the Federal Ministry for Economic Affairs and Energy). The results of the three projects will be presented jointly at status conferences. Eine neue Publikation „Stakeholders’ Interests and Perceptions of Bioeconomy Monitoring Using a Sustainable Development Goal Framework“ ist verfügbar. Ein Diskussionspapier zum „Einsatz von MRIO zur Berechnung der Fußabdrücke von Nationen – Eine Anwendung der EXIOBASE-Datenbank“ steht zur Verfügung. Ein Bericht und eine Übersicht der ausgewerteten Literatur zu Produktökobilanzen in der Bioökonomie steht zur Verfügung. Copyright © 2019 SYMOBIO. Alle Rechte vorbehalten.